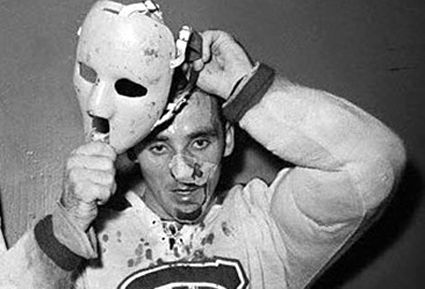 Jacques Plante ushered in a new era of goaltending back on November 1, 1959 when, after being struck in the face with a shot by the New York Rangers hard shooting Andy Bathgate, he was assisted off the ice, leaving behind a trail of blood. "He had been struck in the face and it opened up a cut from the corner of his mouth all the way up through his nostril," related Red Fisher of the Montreal Gazette. 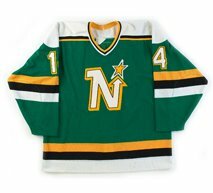 With no backup goaltenders on the roster in those days, there was a 21 minute delay while Plante was stitched up. When he finally returned to the bench, he told head coach Toe Blake, "I'm ready to go back in but I have to wear my mask." He was allowed to wear the mask, which he had been wearing in practice, and Montreal went on to win the game 3-1. Before the next game Blake did not want Plante to wear the mask, to which Plante replied, "If I don't wear the mask, I'm not playing." Having been a four time All-Star, four time Vezina Trophy winner and five time Stanley Cup champion at that point in his career - the mask stayed. 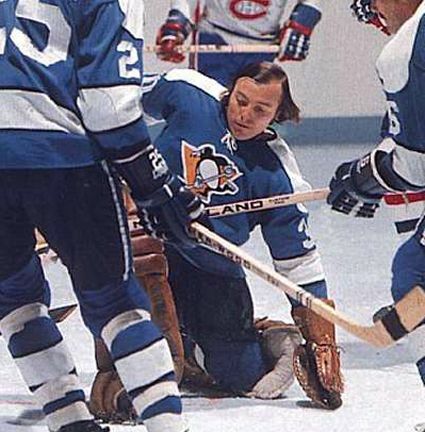 Others quickly followed Plante's lead and goalies who did not wear a mask soon became the exception to the rule, with the last in the NHL being Andy Brown in 1974. While Gerry Cheevers was the first to wear a decorated mask on November 8, 1967 in a game vs. the Rangers when he wore a mask with the first of his trademark stitches drawn on it with a marker, it is Doug Favell who is credited with having the first painted mask in the NHL, which debuted on this date, Halloween, in 1971. "It just came from bantering in the morning because it was Halloween. We were all kidding around in the room and somebody said "If you're going to the party tonight, you have to dress up" and somebody was kidding me, and someone said. "Favey, why don't you show up tonight as a goaltender?" I said, "Maybe I'll do that," so the kidding started. As I was getting ready to leave, I said to Frank Lewis, who was our trainer. "Frank, with tonight being Halloween, why don't we put orange on the mask? Can you paint orange on the mask? We'll paint it orange like The Great Pumpkin," because back then Charlie Brown and The Great Pumpkin were a big thing. "Why don't we paint it like a pumpkin tonight for Halloween?" "Yea, I can do that," Lewis replied. So he took it home that afternoon and painted it orange and I came back that night and wore it. And the funny thing is, we're all so superstitious that if we hadn't won that night, we beat L. A. 4-1, I'd have probably just painted it white again. If we'd have lost, I'd have said "That's it. It's not good," but we won and got going, got on a little streak, and I said, "This is a pretty good thing." It was that simple. Some players said it was a distraction because it was fairly bright. An ophthalmologist said, "Your eye will attract." I thought it was an advantage because your eye would naturally go to the brightest thing, so in that flash, they would look at my mask instead of looking at the net, so I thought it was an a distraction and I felt I needed whatever I could get to distract the shooters, so I went with it and next year we painted the starburst on it, which was a design and was even more of a distraction to the shooters. Additionally, the "little streak" story does not hold up well, as the Flyers lost their next three games and went 2-7-3 over November 1971. The club actually did not have a winning month until five months later in March. If the mask had debuted in 1970, the story is much the same, with Philadelphia going 4-6-1 in November of that year. Favell's story on the end of the solid orange pumpkin mask, thanks to a late Buffalo Sabres goal on the final game of the season, took place on April 2, 1972 when Gerry Meehan won the game for the Sabres with just four seconds remaining, has been consistently told by Favell, and dates the orange mask to the 1971-72 season. reaffirming its debut as being on Halloween in 1971. Favell debuted with the Flyers during the first year of league expansion of 1967-68. 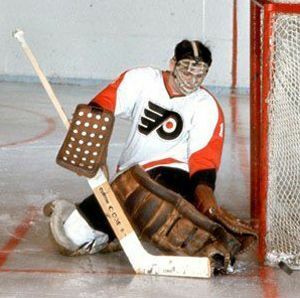 During his early days with Philadelphia, he wore a Terry Sawchuk style mask before changing to his Ernie Higgins produced mask for the 1971-72 season, the style which he would have famously painted orange on Halloween in 1971 after having the new, white mask for less than two months, which leaves photos of Favell in his plain white mask as a rarity. 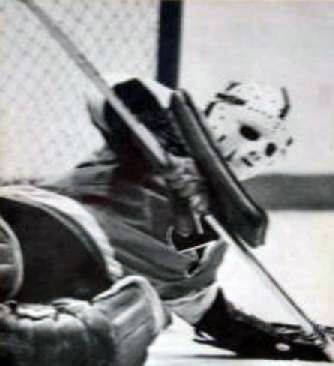 Following its humorous orange paint job on October 31, 1971, the Favell's mask would remain solid orange for the remainder of the season through the fateful last second goal against Buffalo to close out the 1971-72 season. 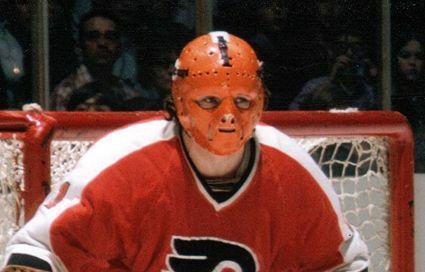 Taking the concept of painting his mask as a distraction to shooters farther for the next season, Favell would wear his new "starburst" design beginning in 1971-72 through the 1972-73 season, his last with the Flyers. 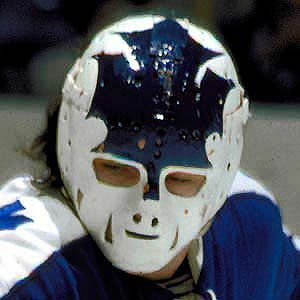 A trade in the summer of 1973 sent Favell to the Toronto Maple Leafs, but before leaving for Toronto, Philadelphia trainer Lewis painted Favell's mask with a blue maple leaf on the forehead and surprised him with it when he came to collect his equipment from the Flyers according to Favell. 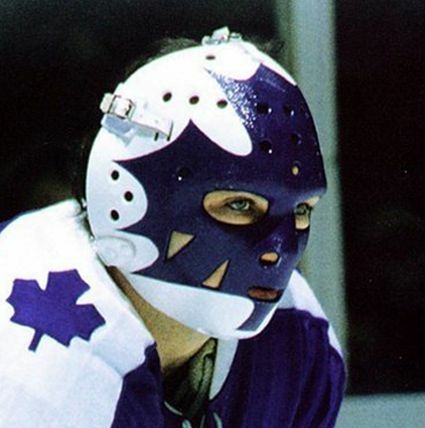 Favell continued to wear the same mask, now sporting its fourth different paint scheme, counting its original plain white, until 1974 when he got a new, more protective mask by renowned mask maker Greg Harrison which featured a larger, more centered maple leaf design which covered his eyes, nose and mouth. 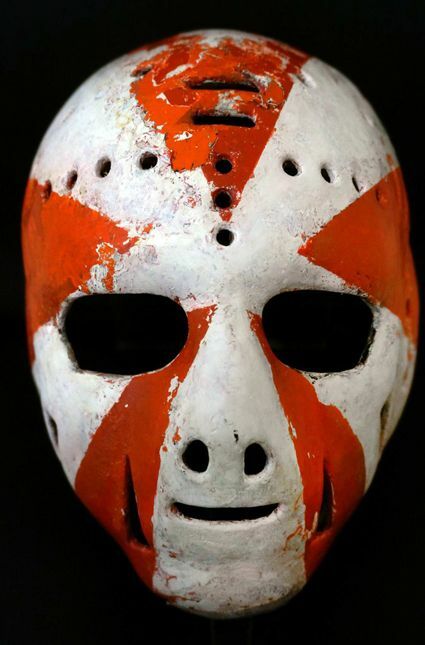 In 2011, game worn hockey equipment dealer Frank Servello noticed the mask the hall had on display was not Favell's original mask, but a replica painted in the same manner. Favell was easily able to confirm the Maple Leaf mask on display was not his original due to details about the mask on display which did not match the one he had used, repaired and modified. 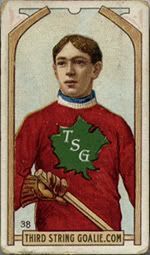 It turns out, at some point, and no one knows when, Favell's original mask, painted with the maple leaf, was stolen from the hall, repainted twice, and then later anonymously returned to The Hall, looking very different from when it left. Favell's original, but now repainted Higgins mask was then put on display by the hall with its red droplet shape on the forehead, red nose and red under the chin, which is generally referred to as the "clown mask", as a vintage mask, but in no way identified as being Favell's, as no one at the hall apparently knew. It was then that a member of the Vintage Goalie Mask Discussion Page recognized the similarities between the clown mask and Favell's missing original in August of 2011 and posted his impression of the clown mask likely being Favell's missing mask. 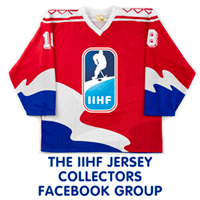 Notified by Servello that his original mask, now repainted, was likely in the possession of The Hall of Fame, Favell met with the hall to first identify his original mask based on his modifications and repairs, and reclaim its possession 37 years after first loaning it to the hall for display. 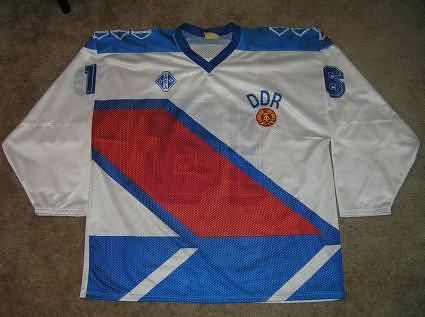 The mask then underwent a restoration process, which revealed first flames over the right eye of the mask as well as a predominantly black paint scheme, which unfortunately adhered to the blue paint of the maple leaf design, rendering that design unsalvageable. 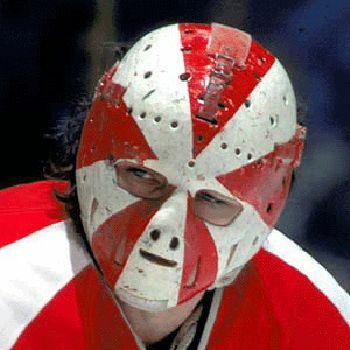 But once the black paint was removed, and the maple leaf design with it, the third version of the mask, the starburst pattern from 1972-73 was revealed, proving it was indeed Favell's original Higgins mask and the first painted mask in NHL history, complete with some of its previous orange paint from Halloween night in 1971 exposed to further document its place in NHL history. 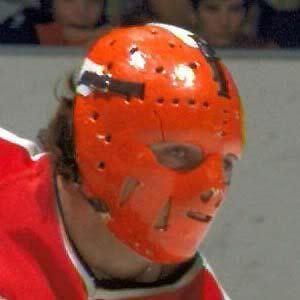 Here are photos from GameUsedMasks.com showing the restoration of Favell's mask, the first painted mask in NHL history, taking it from its twice vandalized state down to its sunburst paint scheme of 1972-74. And here is the final restoration down to the sunburst mask (with some of the earlier brighter orange paint revealed on the forehead, showing the mask's history), the first mask with a painted design. This is where they chose to stop the painstaking process of removing the layers of paint which were added to the mask while it was out of the possession of the Hall of Fame. Here is a Toronto radio interview with Favell from 2011 on the day he got his original, now repainted mask back from the Hall of Fame. Here is another feature on Favell and his mask from Hockey Night in Canada. Excellent article and research. 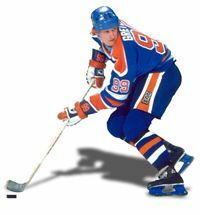 I don't know much about hockey but in my entire life- and years of watching sports highlights- I've never known a time where they weren't painted. I had no idea that it was known when and where they first were. Cool! Thanks for the compliment. We appreciate getting them. It helps keep our batteries charged to know people enjoy our articles. We've been wanting to tell that story for nearly a year now, so it was nice to finally get to the appropriate date to publish it.